Brrr it's cold outside! I don't know about you, but I'm ready for spring. My skin is feeling the effects of this frigid weather and being cooped up in the dry heat all day. 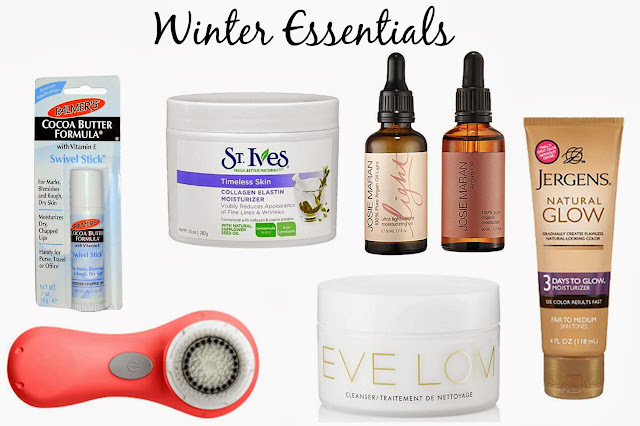 So today, I thought I would share my favorite products that I love using during the winter months. Palmer's Cocoa Butter Swivel Stick: I heard about this on the Doctor Oz show and it's quickly become my go-to for everything...dry lips, chapped skin, blemishes. Doctor Oz also recommends it for wrinkles. I keep one in my purse and one at home next to my bed. St. Ives Timeless Skin Collagen Elastin Moisturizer: This has been my favorite moisturizer for a few months now. This moisturizer is light, smells amazing, and won't leave your face feeling greasy at all. I use it daily right before I put on my makeup. It's a bargain at $5 for a HUGE tub. Josie Maran Argan Oil: So happy I finally tried a face oil. I assumed it was only for people with extremely dry skin but works for every skin type. I use it nightly before bed and my skin feels so smooth when I wake up. Sephora sells mini bottles (in the light and regular version) right by the checkout counter if you want to test it out before taking the plunge on the full size. Jergens Natural Glow: I think everyone knows about this stuff. If you didn't like it the first time you tried it, I urge you to try the new version. I'm SO much happier with it now that they've changed the scent. Eve Lom Cleanser: I bought this last year using a bunch of Birchbox points and it was worth every penny. It's a cleansing balm that you use with a muslin cloth and hot water. It's such a treat. It removes every spec of makeup (including waterproof mascara) and leaves your face feeling ultra smooth. Clarisonic Mia: I can't remember if I've blogged about this or not but my love for my Clarisonic continues! Exfoliating is a must for me (especially in the winter) and this gives me the best results. I keep mine in my shower and use it daily! So glad I found this post. I've been taking an acne medication that makes my skin SEVERELY dry. Can't wait to try out some of these products! Just wondering how you put up the polka dots....? Was it difficult? They are peel and stick! Not hard to put up once I figured out how far apart I wanted each one from each other.